New York City is not just the most important financial center in the world, but also a major tourist magnet. With tens of millions of visitors each year, there’s little doubt that the Big Apple is at the top of most people’s travel bucket list. Yet, one thing that keeps people away is obviously money. NYC has a reputation for being expensive and that can be a source of anxiety for visitors. Like most cities in the world, there are many fantastic locations you can visit in this metropolis that are absolutely free. They are in the hundreds, but we’ll look at some of the outstanding ones below. New Yorkers call it The Met. It’s a massive museum to the east of Central Park. There’s no way to cover the entire museum in one visit. It’s best to examine what subjects you are most interested in and focus on those. The Met’s collection includes African, Roman, Greek, Byzantine and ancient Egyptian galleries in addition to contemporary American art, as well as European paintings and sculptures. There’s body armor, antique weapons, costumes and musical instruments. During the summer, make sure you pay a visit to the roof garden which has not just breathtaking views of the city skyline and Central Park, but also a sculpture exhibition. Weekends and midday weekdays tend to be the busiest, so plan to visit early morning or late afternoon on weekdays. Whereas entry is free, most visitors will either pay the full recommended price or offer a donation. New Yorkers will cringe that anyone would consider Times Square a place worth visiting, but it’s important to give credit where it’s due. While the city’s residents abhor Times Square and do whatever they can to avoid it, this is a location that’s hugely popular with tourists. Referred to as the Crossroads of the World, this is the beating heart of New York. It’s a cacophony of light and noise that’s packed with people all day and all night. When people call New York the city that never sleeps, they probably mean Times Square. If you are lucky to be there around during the New Year, the atmosphere is electric. More than a million people gather to watch the world famous ‘Ball Drop’ where a huge ball of light is slowly lowered from the top of One Times Square. Completed more than 130 years ago, the nearly 1,600-foot-long bridge connecting Brooklyn to Manhattan across the East River is as defining of the New York City skyline as the Empire State Building. It was built from granite rock and limestone shipped by boat on the Hudson River from Maine. A popular walking or biking journey across the Brooklyn Bridge starts at Manhattan’s Center Street close to City Hall where there are great views of the Manhattan Bridge, the Statue of Liberty and Governors Island. When you get to the middle of the bridge, pause and enjoy the magnificence of the Manhattan’s skyline. This 843-acre park in Manhattan has been featured in countless movies. 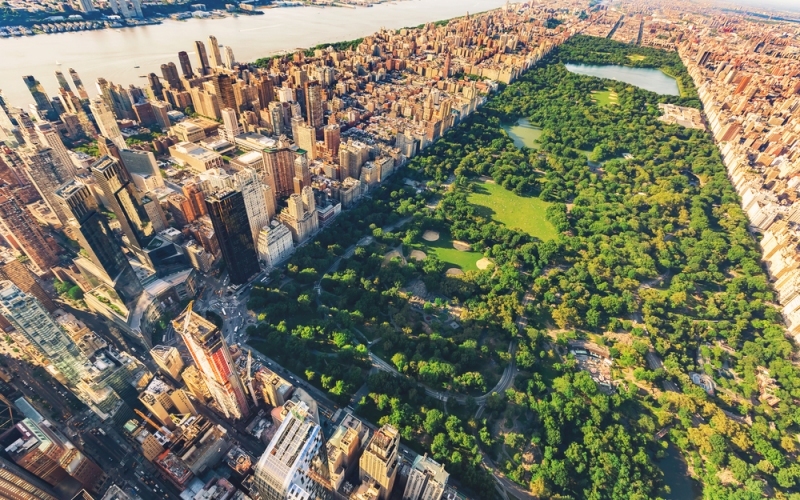 A favorite destination for New Yorkers and visitors alike, it features miles of paths, a reservoir, ice rinks, a zoo, a theatre, and sprawling grasslands ideal for ball games and picnics. If you are around during the winter, join other skaters at the Wollman Rink. In the summer, a spontaneous baseball game, a calming boat ride or just reading a local newspaper under one of the trees are all nice ways to unwind. There are plenty of pedicabs around the park and you’ll probably be tempted to take one. Pedicabs, however, can be prohibitively expensive. You’d be better off going on a bus tour. Check out the different tour specials. The subway is at the center of daily New York life and none of its features is as famous as Grand Central Terminal. Built more than a century ago and occupying a full two city blocks, it’s much more than a train station. The beautiful, marble-floored Main Concourse sits under a 125-foot high ceiling painted with a night-sky mural. The opal and brass clock at the center of the concourse is a famous meeting point. Next to Vanderbilt Hall, formerly a passenger waiting room, is an event space and exhibition. Kids will be mesmerized by the model trains in the transit museum. This picturesque park is set on an elevated, reclaimed industrial rail line that spans across 24 blocks from 34th Street to Gansevoort Street. There are 10 sets of entry/exit stairs that provide access to the streets below. Benches and chairs sitting among the grasses and trees provide an exciting backdrop for observing the Hudson river. Check out the rotating artworks around and along the High Line. At 18th Street, an amphitheater-like enclosure over Tenth Avenue is a nice setting to watch the busy traffic zoom underneath you. If your timing is right, the sunset is breathtaking. Chinatown is one of the city’s most densely populated neighborhoods and it can be hard to believe that it’s still growing in population. It’s teeming with dim-sum temples, noodle bars, pastry shops, fortune tellers, fish markets and a plethora of street vendors and stores selling watches, handbags, fragrances and accessories. There’s years’ worth of places you can visit in New York for free. In fact, unless you’ll be in the city for at least a couple of months, it’s going to be difficult to decide which of the key locations you’re going to go to. An important point to note is that whereas a location might allow free entry, you have to factor in the transportation costs necessary to get there.